One of the most under appreciated parts of your bathroom is the linen closet. Its easily overlooked yet you use it everyday and it doesn’t just have to be a dumping ground for towels. After a big closet clean out I started brainstorming ideas of how to elevate those builder grade shelves and amp up the style without breaking the bank. I’ve always loved the fresh and timeless look of marble and I haven’t met a bathroom or kitchen that it didn’t shine in. Its just so beautiful, sophisticated and transcends so many styles! My grandmother used to treasure all of her furniture with marble tops that dated back to her first years of being married in the early 1940’s. Its just everything and I want it everywhere. Getting a marble slab and cutting it down into shelves wasn’t really in my budget or timeframe (I was looking for an easy Saturday project) so after a quick Google search, I came across marble contact paper and decided to give it a try! If I’m being honest, I wasn’t sure if this was going to work out as the idea of using marble contact paper in place of actual marble seemed far fetched and a bit of a hack (I guess technically it is though). Skepticism aside, I’m always up for a quick and dirty project that is cost-effective and I can do myself and this perfectly encompassed that concept. Plus, the paper is really pretty good! Before starting, make sure to fully clean and prep the surface. I did a big clean out and organized the heck outta my closet and threw a ton of crap away, which felt so great! Organization is an amazing thing for mental clarity! The patience part is key. 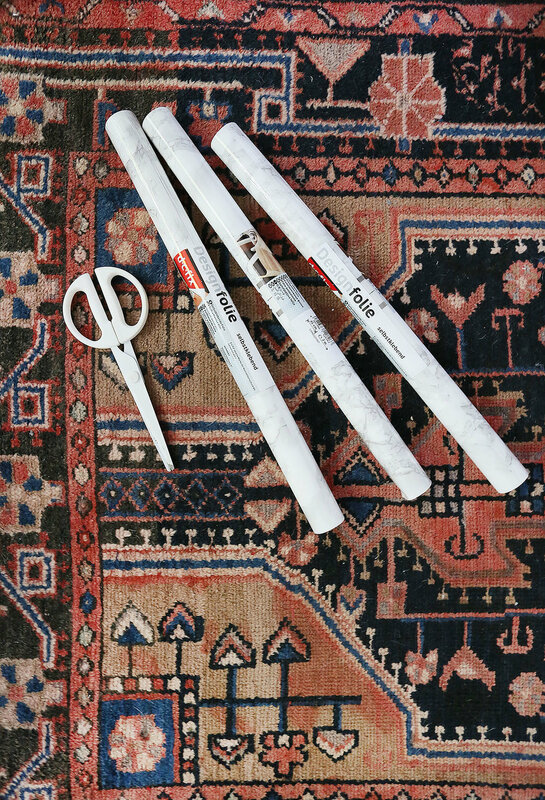 Take your time and slowly pull back the wax paper backing as you stick the paper down. I just used my fingers to press down, but using a credit card to flatten as you go might be better. Make sure you knife is sharp for cutting corners and edges. I can’t emphasize enough to take your time. Going too fast will cause air bubbles to form and you want this to look as smooth and realistic as possible. There are definitely some mistakes in my application, but overall it looks great and you can’t really tell from afar! My shelves are definitely feeling more fresh and sophisticated. If you are wondering about the quality of the paper, I would say its great and it goes on pretty easily (if you take your time!). My only slight hesitation for not giving it 5 stars is I would have preferred a more matte/honed look and this paper is kinda shiny. This is a great and quick way to amp up your linen closet or pantry (I’m pretty sure I will be using it in there too) and can be completed in about 2-3 hours, depending how much real estate you have. So fun and easy! I hope this inspired you to tackle and give some life to a forgotten space in your home! The possibilities for using this are endless!